We’ve seen DJ parties with iPods and now handheld remote controls for DJ software. But what about building mixing features into the portable player itself? That’s the idea of the Pacemaker, a new portable player promised for Fall. DJ features and mixing are internal to the player, and there’s rich playback support in general. You can cross-fade on the unit itself, and add effects, with dedicated headphone and line out jacks and cueing features. There’s a multi-function touch control for all these features. As a player, it looks great on paper, with a 120 GB hard drive and support for OGG, FLAC, and AAC in addition to the usual MP3, WMA, and WAV. (Apparently no line recording, which would really make this a must-have, but some of the specs are still unclear.) If they don’t botch the design somehow, I can see this appealing to electronic musicians as much as DJs. We haven’t seen the first product yet, but they’re promising more — “a pallet of innovative products and digital services … Everyone can be the DJ!” Not everyone can be product designers and manufacturers, though, so a lot (build quality, effects quality, usability, actually shipping) depends on the shipping product. 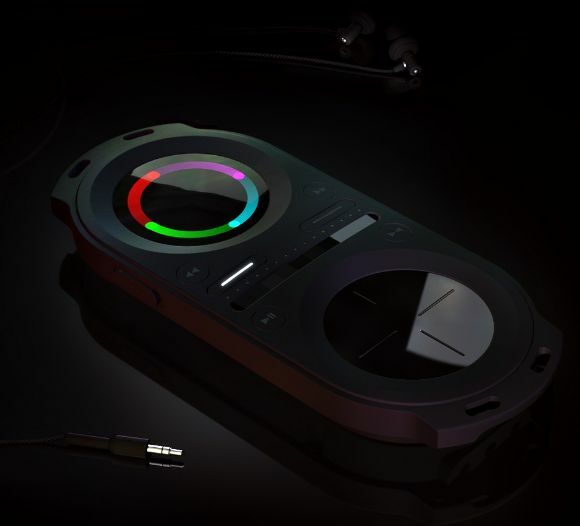 This isn’t the first time manufacturers have talked about creating an “iPod killer for DJs.” A research team at HP had the unusual idea of building a player around a ring, with motion sensors scratching tracks and streaming to other devices for collaboration. Those ideas don’t sound so far-fetched any more, with the Wii popularizing motion control and the Zune popular– uh, implementing wireless sharing. Wearing a music player as a ring still sounds silly, though, and like many research projects, nothing came of HP’s DJammer. Thanks to Oscar and Louis and Jaan for sending this in! Ableton Live: Are You a Dragger, or a Freak?